The youth hostel is situated at Blumberger Damm in 12683 Berlin, Germany. 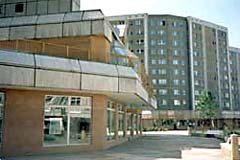 The 700 year old Marzahn, now with its tower blocks and surrounding modern infrastructure, is still preserved within the heart of the village. For natives and foreigners alike, numerous opportunities are on offer to explore the roots, creation and expansion of the city district of Marzahn. We will organise on request a short or lengthy tour of the village, including a visit to the museum of local history, Marzahn's local landmark- the post mill, as well as the opportunity to talk with students of the region or to get to know local businesses. Leisure forum Marzahn - pure culture and live action - only a few minutes away from the "Pro-social" house. 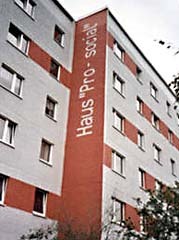 The multifunctional house- conceptualised at the start of the 1980s by Professor Eisentrau- has fully met the most modern communication requirements. The 15,000 m² area houses a hall and studio stage, a swimming pool and sports hall, sauna and tanning studio, bowling, students' leisure centre, library, seminar rooms as well as the Malibu restaurant and disco/bar. For nightowls: a night-bus takes you right up to the door! Cecilienstrasse. Then about 1 min walk to the house. Blumberger Damm/Cecilienstrasse (7 stops). Then about 1 min walk to the "Pro-social" house. 3. Take train (S7) to the rail station (S-Bahnhof) Springpfuhl. From here, take the 391 bus to Blumberger Damm/Cecilienstrasse (7 stops). 'Pro-social' house is only a 1 min walk away from the bus stop. ...has developed since its opening in 1984 into an important location for constantly changing exhibitions of contemporary German and European art. 'Environments', installations, performances and video/multimedia exhibitions take their place next to paintings, graphics and plastic sculptures. The gallery is presented as a place of hyperactivity and communication. ...come to Berlin, to the youth hostel floors in the "Pro-social" house! ... good location for school trips to Berlin, children and youth groups as well as young individual travellers. Guests up to the age of 27 will fit right in here. Those who want to experience someting special and get to know Berlin will feel right at home here! Groups, singles, families as well as people with disabilities will experience much more here than just a place to stay for the night. The floors of our "Pro-social" house are equipped with hobby-rooms. All guests and visitors will find numerous ways to spend their spare time in our hobby-rooms. The spacious outdoor area offers the perfect site for sport, games and open air parties (playing area and room for barbecues in front of the house). The 2 storey youth hostel holds 90 places in 12 4-bed rooms with single beds, 12 2-bed rooms and 6 rooms for the disabled. All rooms are separate and are complete with toilets and shower. On both floors, you will find a communal canteen and club lounge. The house contains a public phone-card telephone and a cash telephone: both floors have an inside-network phone for guests to receive calls. On the guest floor there is a cold and hot drinks vending machine which even sells soup! Our youth rooms, 2- and 4-bedrooms, are simple and economical. Here you can live, sleep, learn and make friends. All rooms have there own toilet and shower/bath. Some of the 3-bedrooms are suitable for the disabled. and room to cook. Here you will find everthing you need for your stay: fridge, oven, microwave, toaster, coffee maker. We ask for your help: please keep it clean during your stay. We offer one or two bed rooms for all those who wish to stay in Berlin for a prolonged period, young people who prefer to live alone or those who desire a relaxed flat-share atmosphere. In every room, you will find a shower and toilet as well as a small hallway. The rooms come complete with the kind of modern furniture you would find in any young person's flat and is well adapted to cater for the individual's basic needs. In the interest of self-sufficiency, kitchens are provided on the floors. In the local vicinity, you will find many shopping opportunities (Plus, Lidl) in addition to doctors' surgeries and chemists. At "Springpfuhl", there is a large shopping centre and a cinema (a few bus stops away). 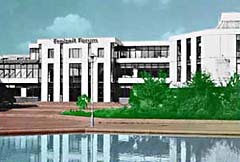 For relaxation, there is the recreation park Marzahn containing the largest Chinese gardens in Europe, the Japanese gardens (inaugurated in April 2003) or the Biesdorf castle with a large Spring festival. The is open-air festival 'Wuhlheide' also within easy reach. Marzahn und Hellersdorf are made of contrastsMarzahn und Hellersdorf are made of contrasts. There are still many natural elements in numerous parts of the primitve Wuhletal (community park) which are juxtaposed with the pulsating everyday goings on in the 'Platte'. The countryside between Wuhletalstraße, Blumberger Damm und Landsberger Allee is etched into the Ahrensfelder Mountains. You can see for miles around and tower over this section of countryside. The Ahrensfelder mountains are 112m above sea level- Marzahn's highest peak- only 3m lower than the Müggel mountains. You will find here rare plants that only grow in fallow. The area around the Ahrensfeldener mountains is used and appreciated by nature researchers, hikers and school day-trippers. In autumn, the kite-flying competition takes place here. If requested, we organise hikes and excursions along the river (with an expert nature guide). If you want to eat out of an evening, we recommend the "Zur Post" restaurant for good German food and traditional Berlin fare (2minute walk away). Children up to the age of 6- half price! We can also make up a packed lunch for you to take away- simply ask! 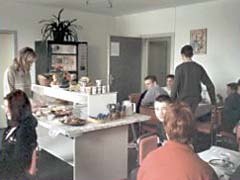 Prices for an apartment on one of the youth hostel floors of the 'Pro-social' house are set with this main objective: to offer inexpensive accommodation in north-east Berlin to young people, young families, school groups and other groups on a budget. In so doing, we function with public interest in mind. 'No dough, no go'? We aim to prove this wrong! Help, motivation and 'power and action' schemes- events such as discos, carnivals, bank holiday celebrations and open air parties (please give ideas on the application form, by email or by another arrangement). 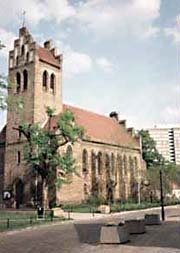 Offer of free-time activities applies to those in north-east Berlin, the city centre or Berlin's surrounding area. Help with project work for specific themes needed (environment, multiculturalism, sociopsychology, community policies, culture etc). The floors of our "Pro-social" house are equipped with hobby-rooms. All guests and visitors will find numerous ways to spend their spare time in our hobby-rooms. The spacious outdoor area offers the perfect site for sport, games and open air parties (playing area and room for barbecues in front of the house. Lecture room with relevant fixtures- also on offer for grammar courses. Bicycle hire, darts, hiking, tournament and indoor sports, pool parties and many more, also access to offers in local community (pool table café approx 300 m away). Sports tournaments also take place on the grounds of the 'pro-social' house'. At the bottom of this page you will find details of adventure tours, meetings, cultural offers and sporting events. If you would like to partake in adventure tours, we ask you to state the corresponding number of the offer on the application form (at least 4 weeks before arrival). E1 Walking tours one day of experiences including a visit to the country laboratory. of Marzahn) in the middle of Marzahn you will see the technical net of drains. E4 The "Pyramid" of Marzahn-a view from the top of the skyscraper (100 meter height). E5 Museum of hairdressing- Walk through the history of hairdressing. E6 Village Hohenschönhausen A walk through 6 centuries. E8 Around the Oranke Lake Discover the area around the lake and notice a special kind of history of the former GDR. E9 Oberseepark Visit of one of the most intersting areas in the north-east Berlin. E10 between Post-billar and Coca-Cola-mountain History and development of the "Plattenbausiedlungen" (mass construction of high-rise flats) as one of the last projects of the former GDR. E11 the backyards of Hohenschönhausen the history of the art of architecture. E12 "Flusspferd"-settlement Visit to an extraordinary settlement, built during the 30years war as well as a visit to the fountain "Horses in the river". E13 Citizens of Hohenschönhausen Which well-known people have lived in the district between Sandino-Strasse and Freienwalder Strasse? E14 Water of Hohenschönhausen Development of the supply situation and the system of drains. E15 From Prerower Platz to the Country park Walking and discovery tour from Hohenschönhausen to Malchow. E16 Tabor-Church in Hohenschönhausen The history of the church is told by the precentor Mr. Jankowski. If you are interested in one of the famous adventure tours, please note the number as well as the date of the planned tour you like to do at your appointement form or your fax. Please notice that you have to request the chosen tour up to 4 weeks before your arrival in Berlin. B1 Children do politics- meeting and tour with the neighbourhood detectives from the Marzahn child and young person's office. B2 Leisure centre "Pappelhof" One day in the leisure centre with disco snack bar in the youth club. B3 Were the Stasi everywhere? Visit to the memorial site Hohenschönhausen with discussion. B4 Life in Marzahn, film-showing "Die da in der Platte", after which a discussion with young people. B7 Visit to current exhibits (local history museum Marzahn) 20 year history of Marzahn to present day followed by a discussion with Dr. Teresiak (history workshop Marzahn). B8 Political life in Berlin a day in the house of parliament. K1 Youth theatre in Hellersoder, visit to the "Weiten Theater" (e.g. "The Secret Diary of Adrian Mole) followed by a discussion with actors and peers. Also disco and snack bar. K2 Get to know Marzahn circus life and take trial lessons with young artists. K3 Children's-musical in Marzahn, visit to exhibitions and experiments for the child musical "Let the Fairytales Live" ("Lasst die Märchen leben"). Chance to meet young artistes. K4 How did it sound at the time? Disco to GDR- music (1978-1989) from the music library "Mark Twain"; in conjunction with the Marzahn music school. K5 Youth club meeting place, young people present their favourite club to you (concerts and dance performances). K6 How does a recording studio work? With members of a young band, visit to the "Masterix" studio. K7 Cinema trip- various performances in different cinemas around north-east Berlin. S1 Sport tournaments: football, volleyball, table tennis, badminton, pool table and darts. S2 Fun-sport roller-blades, skateboards. The "Liberty-Park" offers free use of BMX paths, dirt tracks for bikers, as well as a half pipe for skaters and a mini pipe. S4 Rocklimbing- fun climbing, having picnics and playing games.